I've been working with Lisette and the team for 4 years now ordering hats for a charity golf tournament I host. The quality of the embroidery and the hats are top notch. Great customer service, great products, great price. Highly recommend! Ordering was so easy and the hats were beautiful. The embroidery was amazing. Very happy customer! Loved the clarity and friendliness of my phone conversations with the staff. I had a unique order and they catered to it perfectly. It is such a pleasure to work with Robin! Our order experience has been seamless from beginning to end. Quality products, excellent customer service. customizedwear.com is the company to use. They treat you the same if your order is 1 or 1000. They are prompt and professional and adapt to your needs. I had not used them in awhile and when I came back, it was like it was yesterday. Quality company and customer service. Absolutely couldn't be more happier.. Hats are totally as described.. Love the quality and fit.. Received order in 2 days.. Will definitely be ordering from you guys again.. Thanks a million for being a company that stands behind its products..
We have purchased a black hat & a flag hat from Customizedwear before. The quality and prompt service is why I order from here. The flag hat we order (item # 6993F) is one of our customers favorite give a ways! Even our drivers strive to be an award winner at the safety meeting just so they can win one of these hats. They are beautifully made & durable. I highly suggest Customized wear & team members like Robin to help you with any embroidery or customized item you need! Absolutely love my business hats!!!!! Thanks for the ease of ordering and excellent product!!! Great customer service and people love the hats for our band. Someone is always wanting to buy one and we had to reorder to get them out to people. High quality hat & great embroidery job! These guys are amazing! The hats were just as I envisioned - we sold out of our first shipment so fast, we had to order more. The hats are great, the service was even better. Thanks! Exceptional Service & Superior Quality! We are highly impressed with not only the customer service of this company (quick email responses, knowledgeable sales reps, & phone communication), but also the *quality* of the products offered. We were impressed with the great quality Yuppong snapback hats we ordered for our business, with detailed and precise embroidery that fit our logo perfectly. If you are going to order hats online, customizedwear.com is the place to do it! We look forward to doing future business with this company and would recommend this service to anyone. Thank you ! We were very pleased with the quality of the hats, I would like to add that I wasn't aware that samples were being pulled from our full order quantity. Something that might be helpful for future! Thanks! 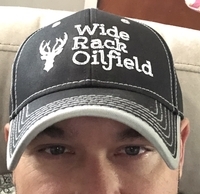 We were very impressed with not only the quality of these hats but also the customer service. We wanted embroidery that was off to one side of the hat and they worked with us to insure that it was perfectly done. The hats are well made and they hold up well! Our hats were exactly as we envisioned them and Lisette worked hard to ensure they arrived on time and for the lowest price. I'm ordering again soon! Just leaving a review to thank Lisette and the team for the great work they did on the hats for the my ski school, SnowPros. I wasn’t the easiest client to deal with as I wanted my hats to look absolutely perfect, lisette was really patient and even modified my logo to make it work better. This is the second time I've ordered hats through Robin. Each time has been great. Awesome Hats and Awesome Service! This is a great company - from their process, to their service, to the end product. Awesome hats and awesome service, thank you!! This is our 3rd order. Quality is great and customer service is awesome. Our customers love these hats and work great for spreading our name around the community. Just got our hats in today and we love them. Robin was great to work with throughout the design process. We ended up ordering more just because they looked so good. The craftsmanship and quality are outstanding on the hats we got. We just reordered twice as many! Thank you. The customer service with this company is above reproach. Robin is great and if you can ask for her I recommend you do. excellent...the best!!! Super great company to work with, caps are great quality an wear very well. Thank you Lisette for all your help. No complaints here. Service was good. Products as pictured. Ordered more immediately. The hats turned out perfectly. The embroidery looks awesome, the hat colors are sharp, and the quality is excellent. Ordering more now!